In the early 1990s a new internal layout was introduced, with built-in underfloor buoyancy. Commonly known as the “Mark 2” design, one of the great benefits that this introduced is that following a capsize the boat comes up with very little water in it. As an active racing class, the design of the “mark 2” GP14 is gradually evolving. Changes are overseen and approved by the Class Association who ensure that the strict “one-class” design is maintained. This has been further modified in the recent years by boat builders like Alistair Duffin (who builds in wood), and David Winder who manufactures in glass-reinforced plastic (GRP). Other boat builders also contribute to the ongoing refinements that ensure the GP14 remains popular and stands as a world class racing dinghy. Whilst improvements to materials, design and ergonomic interior changes benefit the latest boats, the external dimensions and weight of the boat are closely controller, and this means that boats of all ages can still compete on an equal “one-class design” basis. 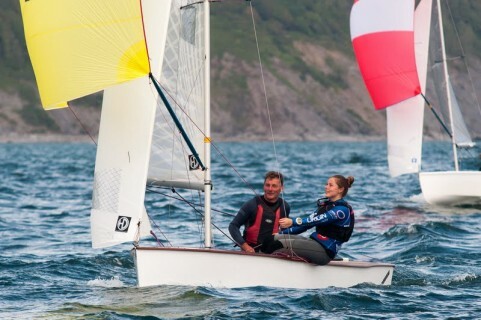 This is exemplified by the GP14 Association World and National championships, which see boats of all ages still competing, and the top sailors are not always sailing the most recent boats!